Let me start off by telling a little about me. Born in Honolulu Hawaii surfed the waves to Seattle and went to school at the University of Washington where I majored in Spanish Language and Literature (Go Huskies!). Been living in DC now for about 9 months and probably one of the best cities I have every lived in! I first got here to work at Polaris Project (check them out www.polarisproject.org) and after 5 months of that internships, I was fortunate to work at AALEAD. I love people watching at parks, eating at buffets (the weirder the better), speaking languages (the weirder the better as well), watching documentaries, and reading biographies. It's been a month now, and I got to meet some cool cats from SSP program, and the Maryland Middle School program. The first week of the middle school program has started and I'm glad that I can finally meet the students. It is going to be a challenging and busy year. I hope I can be effective and fun at the same time. Please make sure to say hi to me when you do see me, I would love to meet you. 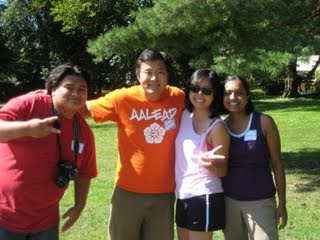 AALEAD's Fall Theme: CULTURAL EXPLORATION! The Good Life Summer Blowout!